On December 18, 1499, the Muslims in Granada revolted against the Christian city government's attempts to suppress their rights to live and worship as followers of Islam. Although the Granada riot was a local phenomenon that was soon contained, subsequent widespread rebellion provided the Christian government with an excuse-or justification, as its leaders saw things-to embark on the systematic elimination of the Islamic presence from Spain, as well as from the Iberian Peninsula as a whole, over the next hundred years. Picking up at the end of his earlier classic study, Islamic Spain, 1250 to 1500- which described the courageous efforts of the followers of Islam to preserve their secular, as well as sacred, culture in late medieval Spain-L. P. Harvey chronicles here the struggles of the Moriscos. These forced converts to Christianity lived clandestinely in the sixteenth century as Muslims, communicating in aljamiado- Spanish written in Arabic characters. 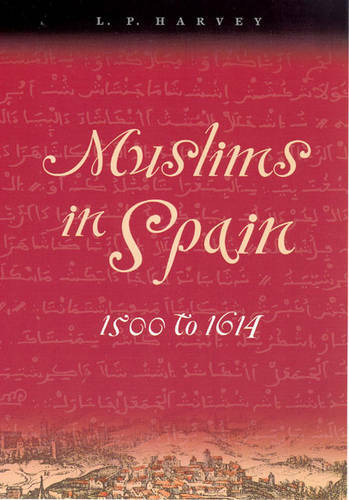 More broadly, Muslims in Spain, 1500 to 1614, tells the story of an early modern nation struggling to deal with diversity and multiculturalism while torn by the fanaticism of the Counter-Reformation on one side and the threat of Ottoman expansion on the other. Harvey recounts how a century of tolerance degenerated into a vicious cycle of repression and rebellion until the final expulsion in 1614 of all Muslims from the Iberian Peninsula.
" The year' s most rewarding historical work is L. P. Harvey' s "Muslims in ""Spain"" 1500-1614," a sobering account of the various ways in which a venerable Islamic culture fell victim to Christian bigotry. Harvey never urges the topicality of his subject on us, but this aspect inevitably sharpens an already compelling book." -- Jonathan Keats, "Times Literary Supplement"
"L. P. Harvey''s important new book, "Muslims in Spain: 1500 to 1614", soberly recounts the ways in which Muslim culture and religion, which had been part of Spanish life for eight centuries, was forcibly suppressed, until Muslims were completely expelled from Spain, between 1609 and 1614. There was much trauma and bloodshed, much secrecy and much dissimulation." --Edward Rothstein, " New York Times "
"L. P. Harvey's important new book, "Muslims in Spain: 1500 to 1614," soberly recounts the ways in which Muslim culture and religion, which had been part of Spanish life for eight centuries, was forcibly suppressed, until Muslims were completely expelled from Spain, between 1609 and 1614. There was much trauma and bloodshed, much secrecy and much dissimulation."